It’s important when writing any article that you do your research. You want to provide readers with accurate information. Whether you get the information from reading other sources or interviewing people, you want to make sure that you’re getting the correct information, and that might take a little digging. Not all articles need expert quotes, but they certainly never hurt. You can make your article stand out a little more by changing what it looks like. Instead of writing an article in paragraph format, try something different. Try list format using bullets or numbers. You can even do a list of do’s and don’ts on the chosen topic. 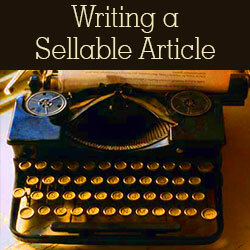 How to articles are the easiest ones to turn into list articles. You can arrange your tips and tricks into a variety of lists. You can also shorten and extend these lists to create a similar, but different articles, turning your knowledge into more sales. Editing and rewriting are important for all writers. A first draft of an article might be pretty good, but rarely will it be perfect. Don’t forgo editing and rewriting. It often helps to set an article aside for a day and come back to it with fresh eyes. You’ll see things you didn’t see before. Trying to edit a freshly written article is difficult. Since you’ve just written it, you know exactly how it should read and you won’t notice minor mistakes. Writing articles is a combination of research and creativity. Both parts are equal in creating an article that is sellable.